Building a house is a time intensive, detail oriented process that is often completely unknown to the future homeowner. In our last blog post, we discussed finding the perfect lot. Now, we will talk about what happens early in the process once you find that dream lot. These steps literally lay the foundation for the type of home you will have for years to come. Once you select your lot, the process of building your house usually starts rather quickly. First, your house will be staked. The staking of the house physically lays down the boundaries for the house for the next phases of the house building process. Once staked, an excavator comes in and physically cuts out portions of the ground where your house will sit. This generally goes down a few feet into the ground. This allows your home to sit securely on a flat surface. 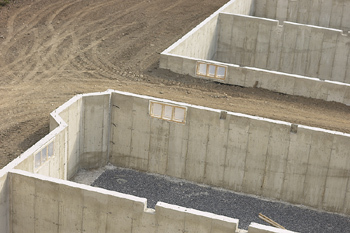 Once dug, the footings for your new home will be put down. These have reinforcing rebar in it. Rebar used in reinforced concrete and reinforced masonry structures. It is usually formed from carbon steel, and is given ridges for better mechanical anchoring into the concrete. Once the footings are in, the actual foundation will be built. At this time, the drain tile will be put in. Drain tile is one of your home’s most important defenses against water damage. Drain tile combined with your foundation's cement footer channels water away from your foundation to prevent seepage into the basement through cracks in the structure. Once the drain tile is in, the backside of the foundation will be tarred. The process of tarring creates a water barrier that keeps water and dampness out of your home. Once a firm foundation is built, this sets the stage for a quality home to be built. The builder can set up the steel and framing for the house at this time. Not cutting corners in this early and seemingly simply step of building a great foundation is crucial. It can mean the difference between a great, secure home and one that never lives up to your expectations and gives you headaches for years to come. As we discussed previously, it is vitally important that you find the right lot. 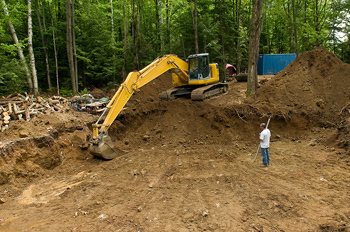 Once you find the perfect lot for your new home, the excavation and foundation of the home is essential to creating the home that you want that not only looks great but is also well built.